The present building originally consisted of one large room with the kitchen in the back. The kitchen was connected by a “dog-trot”, or open walkway. The home was constructed circa 1800 by Jean Mouton, who was one of the first settlers of Southwest Louisiana. Around 1825, his son, Alexandre, lived here. Alexandre Mouton was the first Democratic Governor of Louisiana. After his marriage in 1826 to Zelia Rousseau,they added three rooms to the structure and occupied it until 1836. 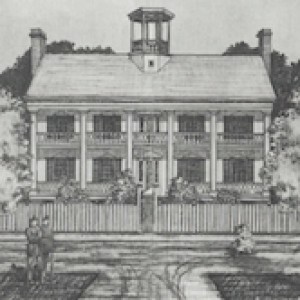 In 1859 Dr. William B. Erwin purchased the house. He in turn left it to his four daughters. For some time, it was occupied by one of the daughters who was married to Isaac Satterfield. In the final settlement of the Erwin estate in 1890, the heirs sold the home to Dr. Percy Girard. In 1913, the building was being rented to Mr. John Ramsey, who used it as a boarding house. The Girards occupied the house from 1920 until the death of Mrs. Percy Girard in the late 1940s. After her death, it remained unoccupied until 1954 when it was bought by Les Vingt Quatre, a group of twenty-four cultural and civic-minded ladies who converted the home into what is today the Lafayette Museum.